(Mens S) Mens Vintage 70s Disco Shirt. Renaissance Paintings Print in Muted Colors! 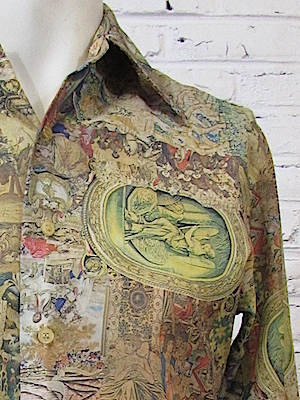 Home > 1970s Disco Clothing > All Disco Clothes > (Mens S) Mens Vintage 70s Disco Shirt. Renaissance Paintings Print in Muted Colors! Mens Vintage 1970s Polyester Disco Shirt! 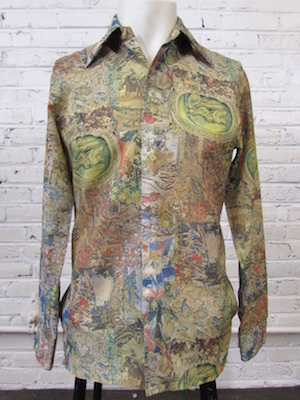 Renaissance paintings print disco shirt in muted hues of gold, green, blue, red and brown for the cultured party animal! Print features a wide variety of different paintings from the Renaissance. Images include scenes of angels, lords & ladies, roman soldiers, dragons and much, much more! Shirt closes in the front with pearly cream colored buttons with two more on each cuff. Super wide 70�s disco collar. Tagged by Trafalgaur. 100% Polyester. Condition: Very Good: Has a small pull in the material on the upper right hand portion of the chest. Still an awesome shirt for your disco party!